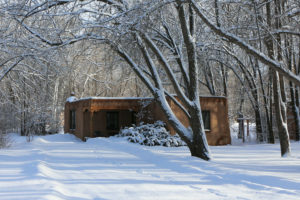 Adobe casita studio at The Helene Wurlitzer Foundation in Taos, NM. I’m spending two months in Taos, NM as an Artist-in-Residence at The Helene Wurlitzer Foundation of New Mexico. I’m hard at work on the score of Turn and Burn, my upcoming chamber opera about rodeo for Houston Grand Opera’s HGOco. As a three-time alumna of the Wurlitzer Foundation’s residency, I’ll also be giving an Artist Talk at The Harwood Museum of Art in conjunction with their special exhibit, The Legacy of Helene Wurlitzer: Works from the Harwood Collection. This event takes place on Friday, March 8, 2019 at 5:30pm. Details at harwoodmuseum.org.